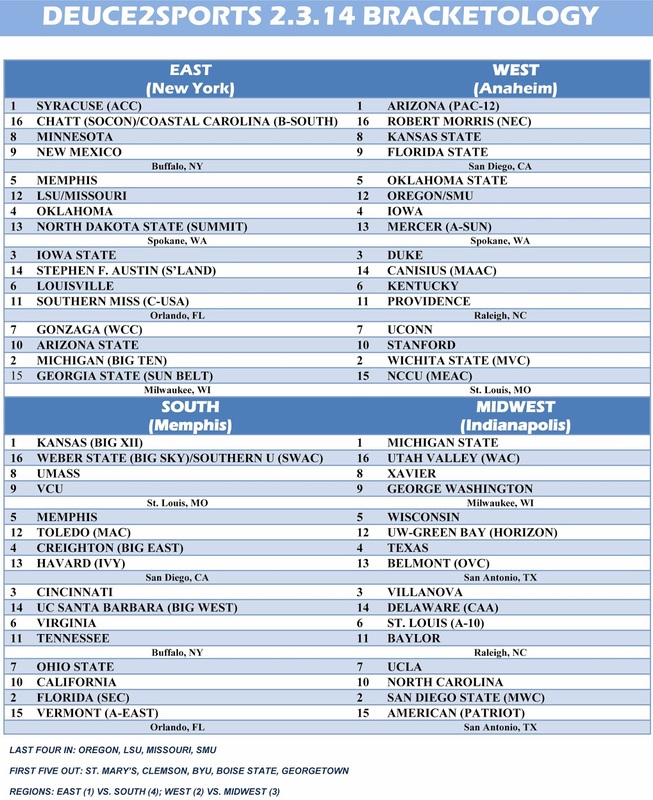 The first Deuce2Sports 2014 bracket projection is here. It really does seem fairly pointless to mess with projections any earlier than early January, about the time the nonconference schedule ends. However, even then you see cases of teams with softer schedules that put up gaudy records (I'm looking at you, Ohio State) appear not only far from the once suspected Final Four lock but closer to a 7/8/9 seed when the conference slate starts. It seems February is a great time to really break down potential seedings as its about six weeks from Selection Sunday and, while things are cut and dry, things are much clearer than they were a month ago. Analysis: Undefeated major-conference teams are a lock for No. 1 seeds at this point. Syracuse's schedule hasn't been as tough as others, although it's been much tougher than previous 'Cuse slates, and the 21-0 record screams No. 1 overall seed right now. Arizona, despite Brandon Ashley's season-ending injury and first loss of the season still is the second No. 1 seed. Now, as the season progresses there's plenty of speculation that Ashley's injury could get the Kenyon Martin treatment and Arizona could suffer on selection Sunday. (Martin's Cincinnati team was 28-2 and a lock for a No. 1 seed before Martin suffered a season-ending injury minutes into the team's opening Conference USA Tournament game. The Bearcats lost the game and the NCAA committee, trying to judge Cincinnati without its best player gave a potential No. 1 overall seed a No. 2 seed in the NCAAs.) At this point I can't see bumping the other No. 1 seeds and some two seeds (Michigan State, Kansas, Florida, Wichita State, etc.) ahead of Arizona. Now, we'll see how things shake up in the next month or so but at this point Arizona is still firmly a top seed. The other two No. 1 seeds are up for grabs. Michigan State, which has fought through injuries to sport a 19-3 record and 8-1 Big Ten mark, was perfect on the road and away from home until Saturday's loss to Georgetown. It was really a stupid game to schedule and it couldn't have come at a worst time for a team that needed all kinds of rest. It doesn't hurt MSU as much (factoring in how committee members view injuries) as much as it helps Georgetown. Kansas has, by far, the toughest schedule to date and has a gauntlet of wins to offset its four losses, all of which are "good" losses. Think of it this way: Instead of scheduling Villanova, Colorado, Florida and San Diego State out of conference - only the Aztecs playing at Allen Fieldhouse - the Jayhawks could have scheduled Akron, Hawaii, Northwestern and Stony Brook (teams ranked 117-120 in Kenpom) and would likely have sported a 20-0 record instead of 16-4 heading into Saturday's clash with Texas. Despite the loss, losing to a projected top four seed on the road is hardly a bad lass. Kansas has the slight edge over Florida for the final No. 1 seed. Wichita State, even if the Shockers go undefeated, will have a tough time getting a No. 1 seed if these four contenders as well as some other No. 2/3 seeds continue to rack up big wins. At this point Wichita State has one great win (at St. Louis) and another good win over a bubblicious tournament team (Tennessee at home). The neutral-site win over BYU looks better at Kenpom than anywhere else as the Cougars are 15-9 with no at-large hopes. Other than that it's been a ho-hum schedule that doesn't appear to offer up any big challenges for the rest of the season. Here's a comparison: Other mid-major No. 1 seeds in recent years have been St. Joseph (2004) and Gonzaga (2013). St. Joesph finished the regular season 27-0 before losing its first A-10 Tournament game to enter the tournament at 27-1. The Hawks played 14 games (50%) against teams in the Kenpom Top 100, including winning games vs Richmond (away), Xavier (away), Temple (away, neutral), Villanova (away), Boston College (home) and Gonzaga (neutral). Gonzaga finished the regular season 29-2 and won the WCC Tournament to enter the NCAAs at 31-2. The Zags played 15 of 33 games (46%) against teams in the Kenpom Top 100 including wins against Oklahoma (neutral), Oklahoma State (away), Baylor (home), Kansas State (neutral) and St. Mary's three times (home, neutral, away). Wichita State, to this point, can at best play 5 of 31 pre-conference tournament games against Kenpom Top 100 foes (two of those games will be against Indiana State, a squad no one is talking about as being a potential tourney team by the way). Heck, if we're going strictly by Kenpom rankings the Shockers would be a No. 3 seed behind teams like Iowa and Virginia. Bubble: The bubble at this point is tough to look at. In reality, any teams projected in the 10-12 range in February brackets are your bubble teams. It isn't to say a team like Indiana can't make a run from outside the bubble to in the field but if a team gets hot everyone will notice. Teams on the bubble now that finish something like 18-13 by going close to .500 down the stretch are likely NIT bound. FINAL FOUR: Based on these projections it would be very easy to take all No. 1 seeds. However, with Arizona's situation (Brandon Ashley's injury) it would be wise to look at other teams in that region. I still think Syracuse is beatable with the right opponent and Michigan might be that team in an Elite Eight matchup. So, in this hypothetical, give me Michigan (East), Oklahoma State (West), Michigan State (Midwest), Kansas (South). You could easily make a case for six-seeded Kentucky out of the west as well or even everyone's favorite team, Duke. A healthy Arizona rolls that region, however. It's sad we'll never know how good the Wildcats could have been this year.